Memories & Musings of a Mature Star Trekker, and home of StarTreKomics! StarTreKomics — A Gallery of Trek Fun! Hey Kids, Get a comfy chair, this will be a long post. At last here is my account of my New York City trip on June 15th, and what a day it was! I arrived at the Greyhound station that Saturday morning at 7:00 to catch the 8:00 a.m. bus. Having settled in the waiting area with 20 minutes to spare, I ran out to my car in the lot to get something when I noticed a meter man checking cars for tickets. Turns out the station had installed a singular ticket machine there (not immediately obvious) which only allowed parking 30 minutes at a time. Long story short, I wasn’t ticketed, but had to quickly park my car a block away in a parking ramp and rush back to catch the bus with only about 5 minutes to spare! You can’t imagine my adrenaline – Gotta get to NY! Well, 3 1/4 hours and 300 miles later, I was there. The play, of course was just amazing, leaving me exhilarated and emotionally exhausted, but now the moment was coming that we all were waiting for: Question and Answers! 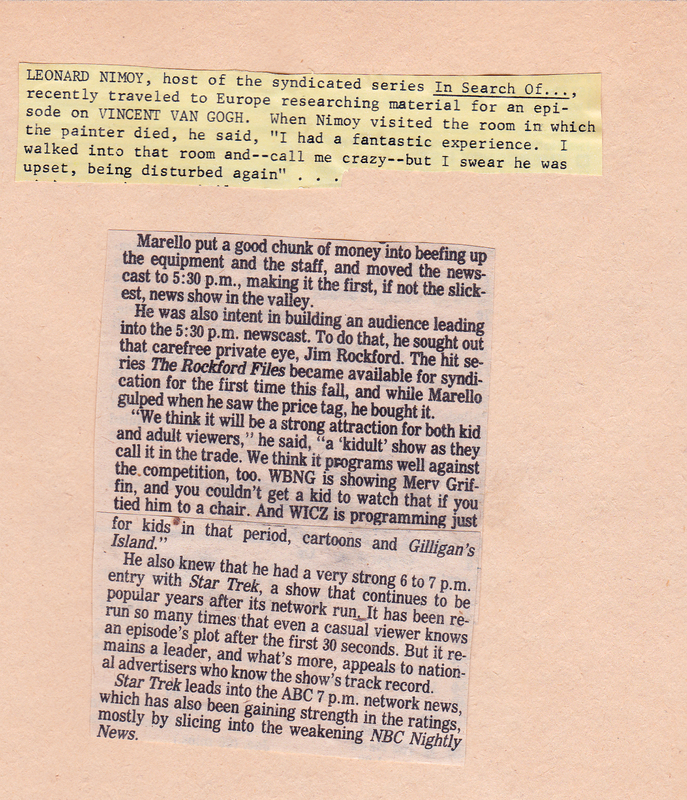 The night before, I had carefully printed out posts from this blog in hopes of giving them to Mr. Nimoy later (This, this, this, this,this and this) and I had a question I wanted to ask about the connection between creativity and sanity. (I just had to be called on! I was in the front row for heaven’s sake!) So we’re all on pins and needles awaiting the moment when he’d walk on. First we were introduced to Laura Kaminsky, artistic director of Symphony Space, Vincent director Paul Stein, and the delightful (and most handsome) actor Jean-Michel Richaud, who had played Theo. 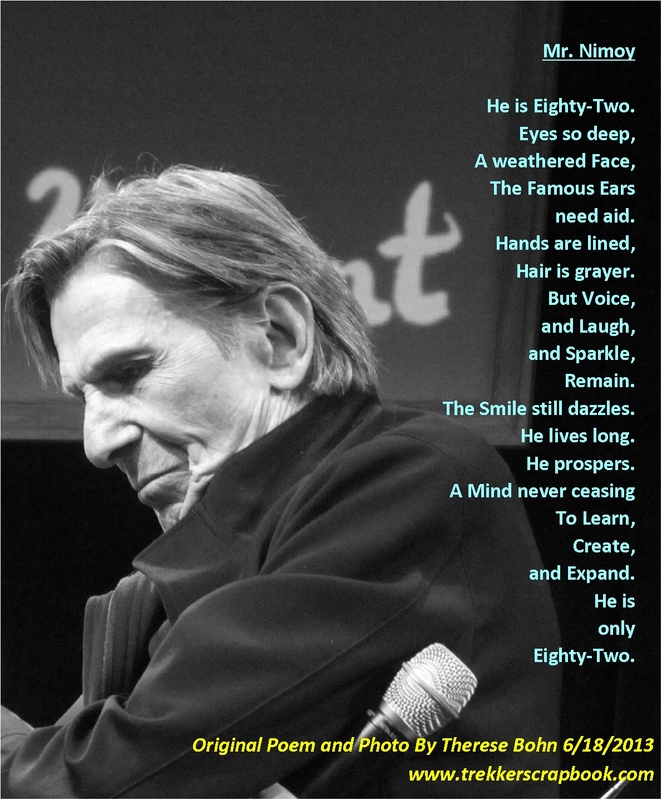 Then came Mr. Nimoy; a figure in black and gray, smiling broadly, with hair shaggier than it had ever been in the 1970’s, and the applause erupted two-fold. My heart fluttered a little; damned if I wasn’t 16 again! I cannot tell you what a delight it was to be sitting only a couple feet away from the stage, and joy in hearing Mr. Nimoy and the crew discuss this production. One moment I didn’t get a picture of, but will never forget was when someone asked if Nimoy would write yet another play, possibly about another artist, to which he said “One’s enough!” On cue, director, Paul Stein chimed in with “Gauguin!” which sent the four into gales of laughter! Note the highlighted sentence in blue! “Hello Mr. Nimoy! I loved the show! I’ve always wanted to see Vincent, and it really moved me. It was so beautiful and heartfelt! Jean-Michel was perfect! My name is Therese Bohn, and I wanted to ask you a question, but there wasn’t time. But you’ve been a wonderful inspiration in my life in relation to my own creativity and photography. I’m also so happy to see you today because the last time I saw you, it was 36 years ago, but I forgot my camera, so may I please finally get my picture with you? (I’d like to think he’d say here “Of course!”) Also, I write a silly little blog about Star Trek which features Spock prominently, and I printed a few posts here for you to enjoy. Thanks so much, and Happy Father’s Day! (Insert hug here). Not quite the dream meeting I’d been banking on, but hey, beggars can’t be choosers. Still very thankful for the chance get that picture and it did nicely bookend my last brush with him. Part of me wishes I acted on my initial impulse to go into the café 20 minutes earlier and introduce myself there, but the good little Catholic girl in me said “You don’t interrupt strangers while they’re eating/socializing.” In the end I just hope he didn’t find me another annoying fan girl! The guy I had been in line with at the beginning of the show, Edwin, did get Nimoy’s autograph on the book he brought with him, and Nimoy, ever gracious even in his hurry, gave us all the Vulcan Salute and a smile as he entered his cab. Sorry I didn’t get a picture of that, but I’ll never forget it, bless him. As I walked, er floated, down the next 10 city blocks, it was the happiest I felt in two weeks, and uncharacteristically, I texted @ ten family and friends with the simple message: Guess who just got her picture taken with LEONARD NIMOY?! If I ever have the good fortune to meet Mr. Nimoy again, I promise him I’ll keep it as civil and calm as possible! For now, I’m so glad I had this day, and that I could share it with you! 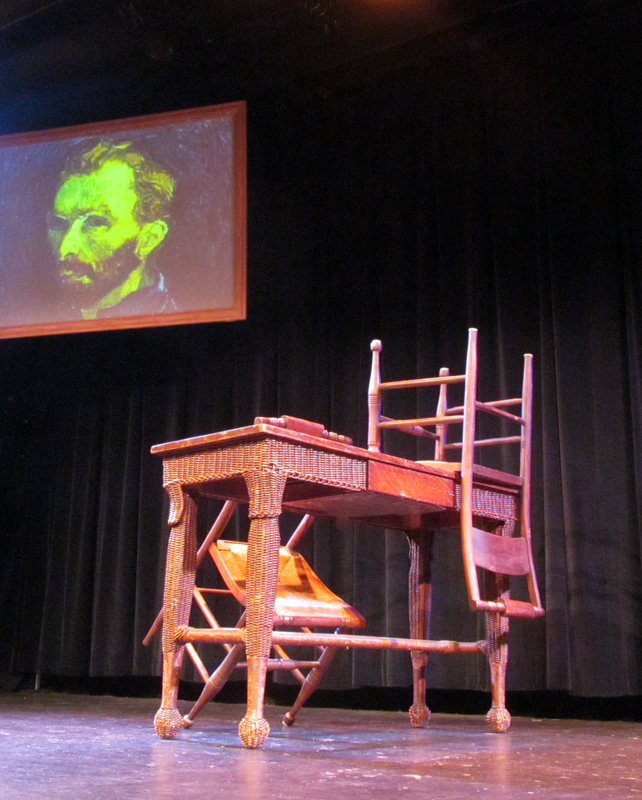 I ventured to New York City on June 15th to see a limited run of Vincent, the passionate one-man show about the life of Vincent van Gogh, and I am so glad I did! 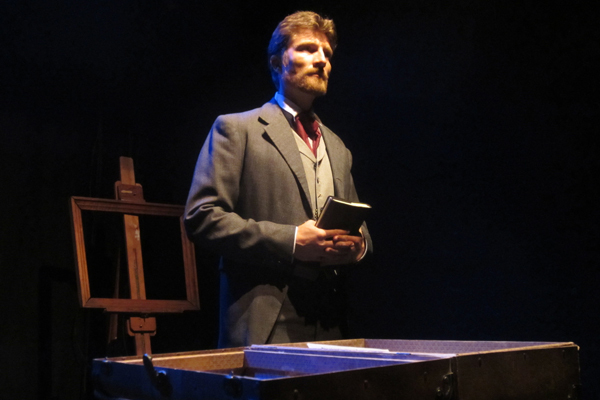 Vincent takes place a week after van Gogh’s death, his life recalled by his mourning brother, Theo, as he ruffles through a suitcase filled with hundreds of Vincent’s letters. 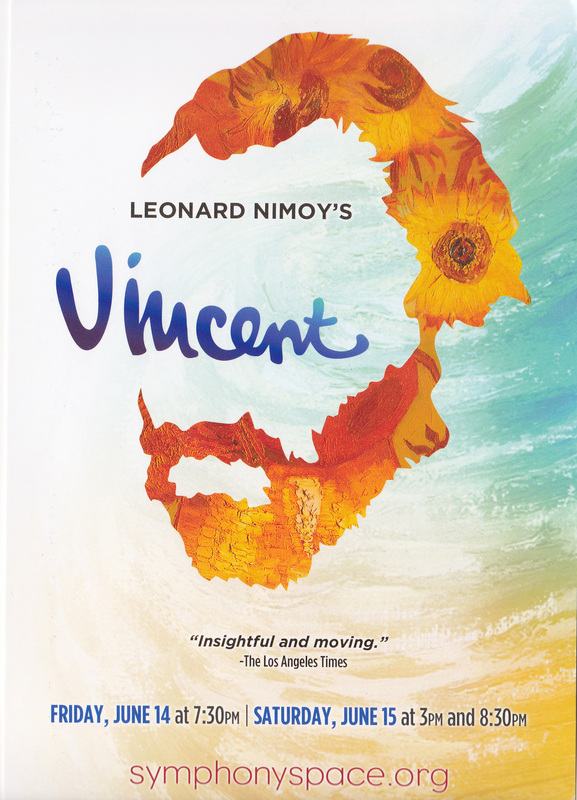 Written by Leonard Nimoy in the 1970’s, and based on the play Van Gogh by Phillip Stephens, Vincent is an astonishing, fervent piece; a 90 minute, non-stop, bang-bang monologue which left me happy, sad, breathless, and totally satisfied. This production starred Jean-Michel Richaud as Theo, and directed with deft passion by Paul Stein. Vincent is presented on a simple set, with a wicker desk and a few chairs, an easel with a frame but no canvas, and a small rear monitor to the side which showcases Vincent’s work throughout. Theo enters meekly, thanking the audience for coming, and asks forgiveness for not being able to speak at his brother’s funeral a week earlier. As Theo goes through the letters he alternates between being himself and his brother, often losing himself in Vincent’s passions. It is a brilliant performance that Mr. Richaud delivers with the full intensity of his heart and soul. As Theo relates his memories, we feel the loss, anger, frustration, and joy of his relationship with Vincent. The brother’s time together churned between love and hate, just as the stars and heavens churn in van Gogh’s Starry Night. But it isn’t all sadness; there are many lighter and funnier moments, some of which made me laugh out loud! And surely despite their hardships, the love between them was undeniable. Mr. Richaud was marvelous, and he totally wraps the audience up in Theo’s remembrances. Early in the show, as we’re told of Vincent’s attempts to be a minister, he impersonates Vincent giving a fiery sermon; all completely in French. This not only showcases Richaud’s heritage, but adds even more to the intensity of the moment where Vincent, ever trying to heal and save his flock, nearly brings the house down. It’s a stunning, exciting moment that, in the original production, was done in English. But even non-French speakers can all the more appreciate the urgency in Vincent’s words with Richaud’s perfect delivery. We learn that Vincent’s attempt to minister is the first in a long line of the artist’s quest to please people, some unorthodox, but always coupled with the need for acceptance. Theo sifts through the letters trying to figure out Why. In a moment of frenzied frustration, Theo cries “Vincent, will you ever learn to love yourself! ?” and he hurls all the letters into the air. It is a stunning moment of despair, but Theo eventually finds solace in knowing that his brother found some peace in the last 70 days of his life, creating piece after piece, as if he knew the end was near. Vincent was happiest with outsiders, prostitutes, prisoners, laborers and eventually found a brief haven of peace in an asylum, where the demons of his Epilepsy could be quelled by his need to create art. His goodbye to Vincent is one of the most beautiful farewells I’ve ever seen on a stage. I would like to see Vincent make it to Broadway, it certainly deserves that chance. There have been regional productions of it, most recently Mr. Richaud’s in Los Angeles. I think anyone who loves art, passion, and life itself should see it; it is a renewing experience. On a personal note, I found myself keenly identifying with Theo in his grief, as at the time it had only been two weeks since my own mother’s passing, and the play proved to be a bit cathartic to me, and just the tonic I needed to help me through this sad time. 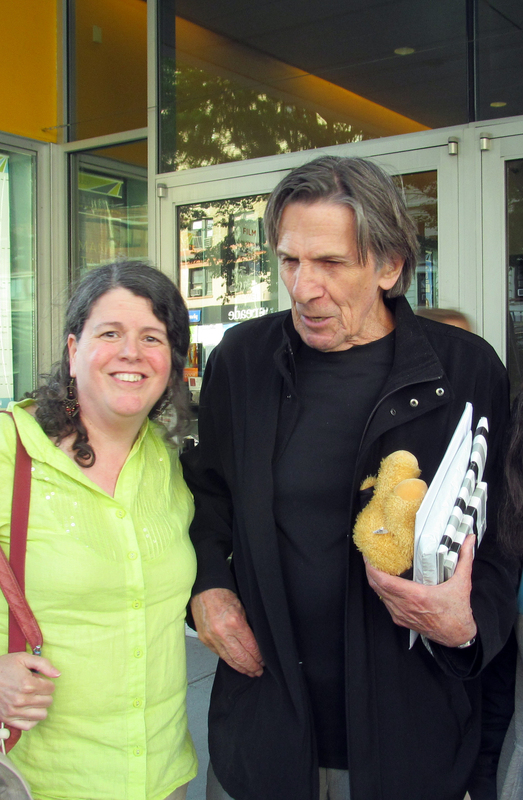 (Of course, seeing Nimoy in person afterward was a huge boost to my spirits, but I’ll get to that in a separate post). · * Vincent was born “twice” – that is, an older brother, stillborn exactly one year before Vincent’s birth, was also named Vincent. As a child he would be taken to his brother’s grave every Sunday, which surely affected his spiritual beliefs. · *Vincent suffered from Epilepsy, and his seizures could produce maddening hallucinations and voices in his head – something that very likely have caused him to sever part of his ear, in a desperate hope of silencing the voices. · * In the last 70 days of his life, Vincent produced an astonishing of art, often two a day, with a grand total of 100 new pieces at his death. · * Heartbroken and ailing, Theo died only 6 months after Vincent. Vincent left me with a greater appreciation of the artist and his work, it also reminded me that creativity is not only a great outlet for one’s art, but also a haven for one’s sanity. 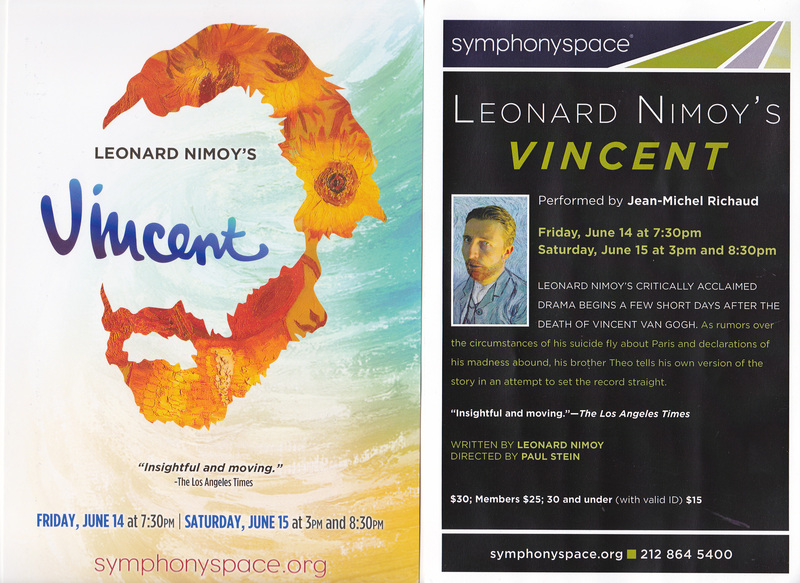 If Vincent comes to your town – get right to it! It is truly love of life on a grand scale. Vincent Review and a whole lot more coming soon! Hey kids, I am currently writing up my accounts and a review for the splendid play Vincent that I saw in NYC this past weekend! I should have it all up in a few hours, thanks for your patience! 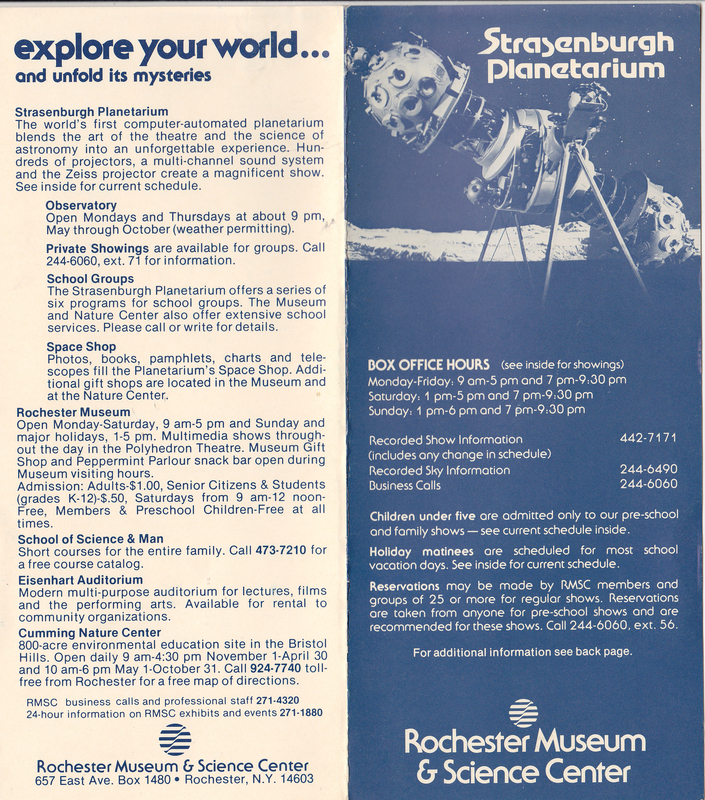 The Daily Scrapbook 5/17/13 -Planetariums, Trek, and Vincent. 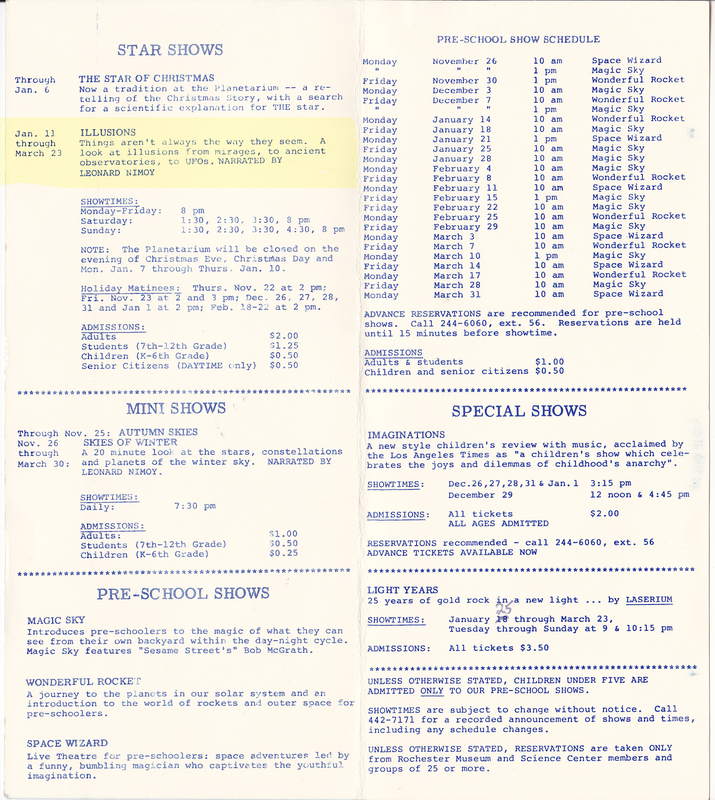 Here’s some stage appearances from Mr. Nimoy, who did a lot of theater in the 1970’s. I wish I could have seen one of these. It looks like pure delight (and hard work) for the actor who loves theater like his own child. My Weekly Spock: My Favorite Star Trek Meme. My Weekly Spock – A Great Candid! Hey! That Guy was on Star Trek!